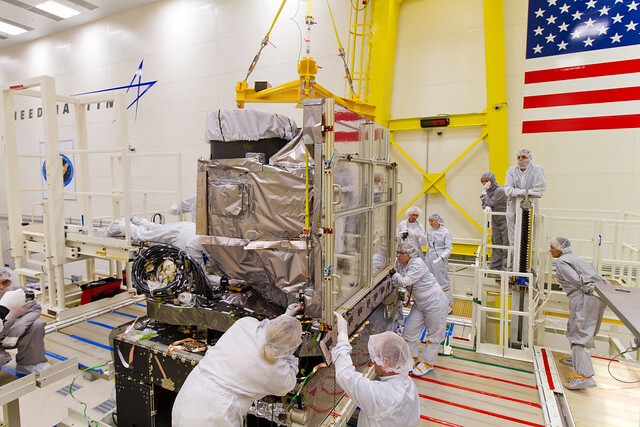 The Advanced Baseline Imager is the primary instrument on the GOES-R Series for imaging Earth’s weather, oceans and environment. ABI views the Earth with 16 different spectral bands (compared to five on the previous generation of GOES), including two visible channels, four near-infrared channels, and ten infrared channels. These different channels (wavelengths) are used by models and tools to indicate various elements on the Earth’s surface or in the atmosphere, such as trees, water, clouds, moisture or smoke. It provides three times more spectral information, four times the spatial resolution, and more than five times faster temporal coverage than the previous system. ABI is a mission critical payload for the GOES-R Series, providing more than 65 percent of all mission data products currently defined. ABI is a multi-channel passive imaging radiometer designed to observe the Western Hemisphere and provide variable area imagery and radiometric information of Earth’s surface, atmosphere and cloud cover. The instrument has multiple scan modes. In mode 4, or continuous full disk mode, the ABI produces a full disk (Western Hemisphere) image every five minutes. In mode 3, or flex mode, the ABI concurrently produces a full disk every 15 minutes, a CONUS image (resolution 3000 km by 5000 km) every five minutes, and two mesoscale domains (resolution 1000 km by 1000 km at the satellite sub-point) every 60 seconds or one sub-domain every 30 seconds. Mode 6, or 10-minute flex mode, which became the default operating mode for GOES-16 and GOES-17 in April 2019, provides a full disk image every 10 minutes, a CONUS (GOES-16) / PACUS (GOES-17) image every five minutes, and images from both mesoscale domains every 60 seconds (or one sub-domain every 30 seconds). All ABI bands have on-orbit calibration. Learn more about mode 6 in the User Information section of the website. ABI is used for a wide range of applications related to weather, oceans, land, climate and hazards (fires, volcanoes, floods, hurricanes and storms that spawn tornadoes). ABI improves every product from the previous GOES imager and introduces a host of new products. It tracks and monitors cloud formation, atmospheric motion, convection, land surface temperature, ocean dynamics, flow of water, fire, smoke, volcanic ash plumes, aerosols and air quality, and vegetative health. ABI’s data enables meteorologists to pinpoint and track developing storms in much greater detail. Future products will also help the aviation industry with aircraft icing threat detection and turbulent flight condition predictions. Benefits from the ABI include improved tropical cyclone forecasts, fewer weather-related flight delays and airline incidences with volcanic plumes, improved production and distribution of electricity and natural gas, increased efficiency in irrigated water usage in agriculture, and higher protection rates for recreational boats in the event of a tropical storm or hurricane. Mesoscale: Provides coverage over a 1000x1000km box with a temporal resolution of 30 seconds, and spatial resolution of 0.5 to 2km. Continental US/Pacific US: The CONUS and PACUS scans are performed every five minutes, providing coverage of the 5000km (east/west) and 3000km (north/south) rectangle over the continental United States (GOES-16) or the Pacific Ocean, including Hawaii (GOES-17). The spatial resolution is 0.5 to 2km. Flex Modes: The flex modes provide a full disk scan every 10 minutes (mode 6) or every 15 minutes (mode 3), a CONUS/PACUS every five minutes, and two mesoscale domains every 60 seconds (or one sub-region every 30 seconds). One-minute infrared imagery of the powerful storm system that brought hail and tornadoes to the Southeastern U.S. on April 5, 2017. This imagery was produced with the “longwave” infrared band on the GOES-ABI, a new band not available on the previous generation of GOES. The one-minute scanning is also a new capability on GOES-16. As seen here, the imagery produced by this band offers spectacular views of meteorological phenomena, such as the colder cloud tops (shown in green/yellow/red) associated with these storms, in rich detail. Of particular note are what's known as "enhanced-V features" on some of the cloud tops, which are indicative of severe storm formation.